Constructed of sturdy plastic for all weather conditions. 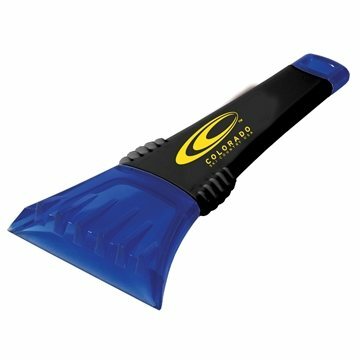 Heavy-duty scraping blade with special grip handle prevents slipping when in use. Easily stores in car glove compartments, side pockets and under the seat. The Quality is VERY GOOD!! It is just REALLY small. I know know how useful it will be as a Snow/Ice scraper. But it is a good promo item for advertising. they were packages in individual bags and it worked out well. Very light and handy. We're satisfied for using it as giveaway at our anniversary celebration. The merchandise arrived perfect also it was super easy to re-order. Great product and cost. All the recipients love it. Came out perfect and really appreciate. it was a big hit!